Hi there, stamping friend! Well, tomorrow is Valentine’s Day. Are you ready, or do you pass on the celebration? It’s always an internal struggle for me; I know that we don’t *need* to be given 1 certain day to express our feelings, but it’s also nice to give and receive those expressions, right? Last Friday evening, I had a group of lovely ladies over, and held a class I called “Love & Stuff”, because we don’t all need tons of Valentine’s Day cards, but we do need cards for other loving occasions, such as weddings and anniversaries. Today, I’m sharing 2 cards that can be used for Valentine’s Day. Now this card, with it’s red & white colour palette, is classic Valentine’s Day! The card base is Real Red cardstock, with a panel of retired Fancy Frost Designer Series Paper on top. 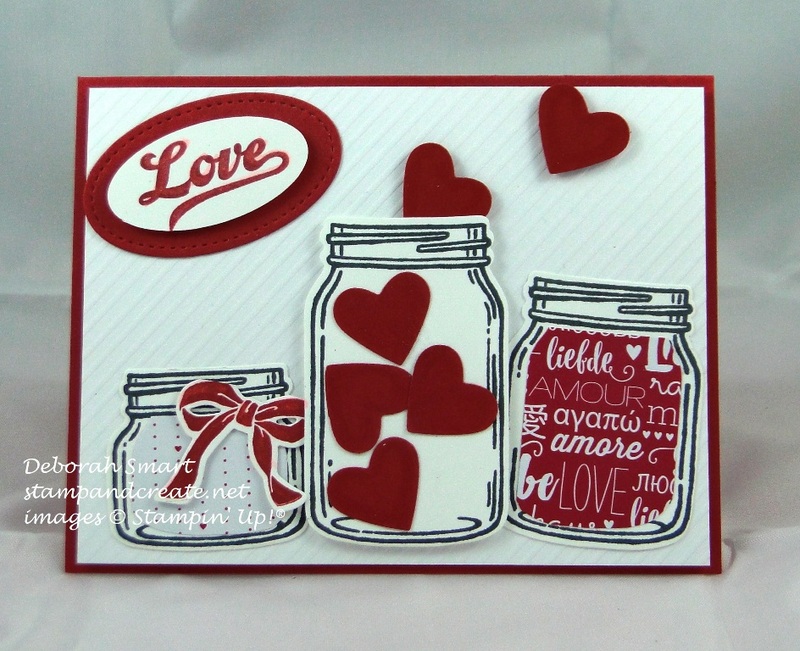 Using the Jar of Love stamp set, I stamped the jar images onto Whisper White cardstock. I used the Everyday Jars Framelits with the Big Shot to die cut them, and the bow, which had been stamped in Real Red ink. To die cut the hearts from Real Red cardstock, I used the retired Heart Framelits dies (I don’t yet have the Sweet & Sassy Framelits). The 2 jars are filled with paper from the Sending Love Designer Series Paper Stack. I just die cut the inside jar shape, then trimmed the paper down, to fit the jars. Real Red ink is used to stamp the sentiment, then punched out using the retired Oval Punch. Then I layered it onto a Real Red cardstock oval that is die cut using the Stitched Shapes Framelits. All of the elements are attached to the card using Stampin’ Dimensionals. This card would be great for Valentine’s Day, or you could use it for an anniversary. I got my inspiration for this card from Pinterest. 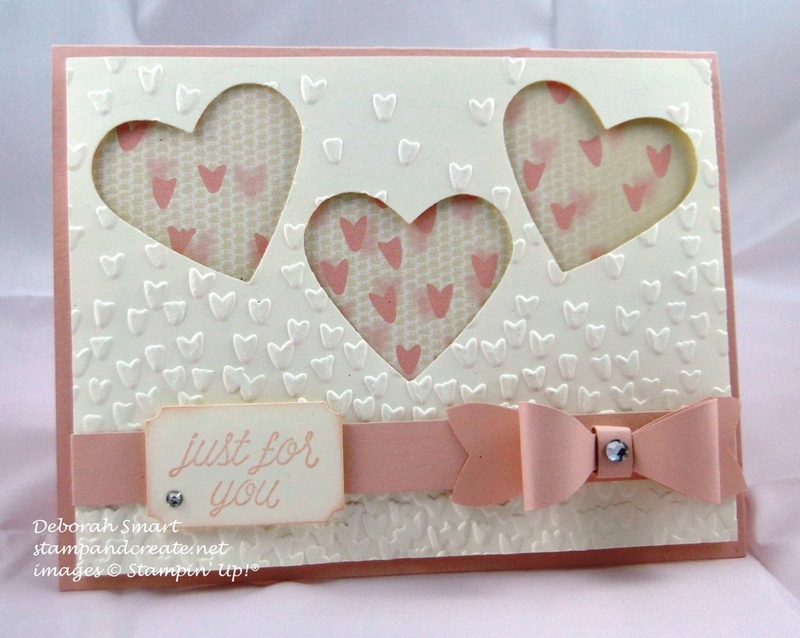 A panel of the little hearts/petals from the Falling in Love Designer Series Paper, is layered behind the die cut hearts panel. Before I attached it to the Blushing Bride card base, I glued a strip of Blushing Bride cardstock across the bottom, then attached a bow I made with the Bow Builder Punch. The So in Love stamp set is used for the sentiment; stamped in Blushing Bride ink, onto Very Vanilla cardstock, then die cut using the Tags & Labels Framelits Dies. Sponging the edges with a Sponge Dauber and Blushing Bride ink softens and enhances the tag just a bit. A Rhinestone Jewel added to the sentiment and the middle of the bow finish off the card nicely. I hope you’re inspired to create your own Valentine’s Day cards! Or just a nice card to give to a friend 🙂 I’ve just been seeing on the internet that ‘Galentine’ is a thing; I guess to give to your best gal friend. Why not?! To order your supplies to make these cards, you can click on the images below. You’ll go directly to my online store. Next Next post: An Awesome Sketch Challenge with the Paper Craft Crew! Thanks For Being That Friend! Super cute ideas, Deborah! Thanks for the inspiration!